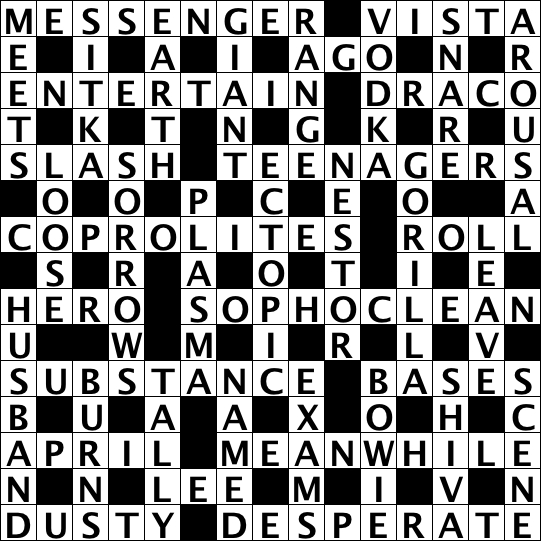 The solution to my March crossword can be found behind this link. Don’t know about anyone else, but Susannah solved it – hurray. I spent ages deciding whether or not to put a couple of commas in to the clues. One of them went in and out 4 times, but in the end I decided it was sneakily misleading, so I left it out. I liked 21, 24 and 30d. 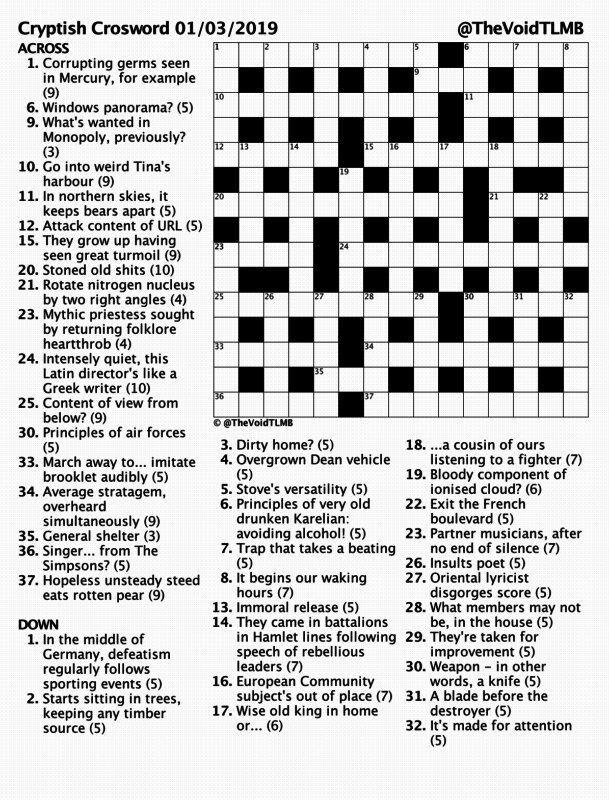 And 14, but maybe the general knowledge was a bit obscure there – but gettable from the wordplay (I hope!). I suppose I’d better start working on April’s puzzle…..
Well, I took a bit of a battering on Rookie Corner. But, it’s all fair enough, good feedback, and I’ll take it as motive to improve. Especially my clue surfaces. Hopefully you’ll find this one a big improvement in terms of the readability of the clues. I noticed a slight problem with the grid layout last night. Nothing awful – it should even make some bits a bit easier – but too late to change now. Could this be my last “cryptish” puzzle? Hmmmm. Meanwhile, here’s the puzzle as a printable PNG, or a browser-solvable embed. Hope you enjoy. 18A riffed on a weak joke I make everytime I’m driving in Suffolk. 11A was my favourite, although I found 14A pleasing. I really liked using “Occam’s Lathe” in one of the clues originally, but couldn’t quite make it parse correctly as a clue, so Killed My Darling. 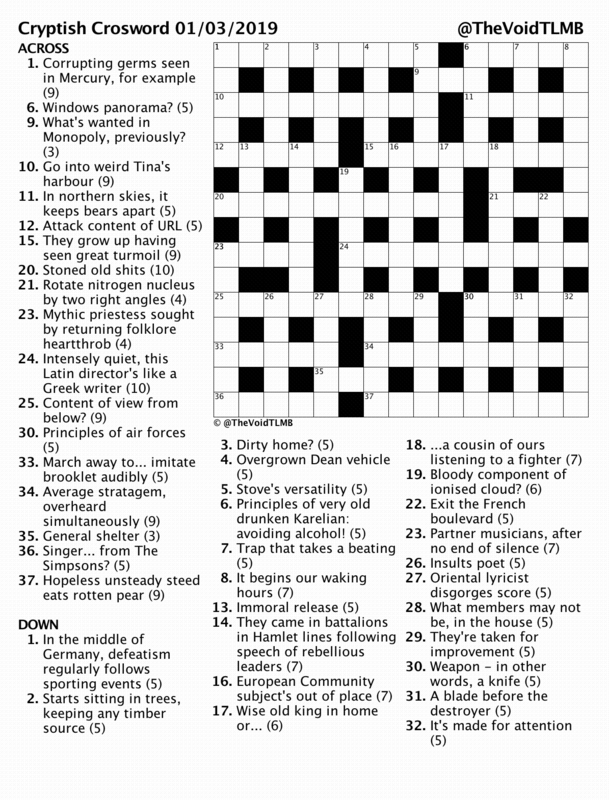 I’m having a new puzzle published on a crossword blog tomorrow. Hopefully I’ll get some useful feedback. Colours to the mast! Here is my February puzzle. Right click to download printable PNG file. Or view it below, in PNG, or as a browser-solvable puzzle. 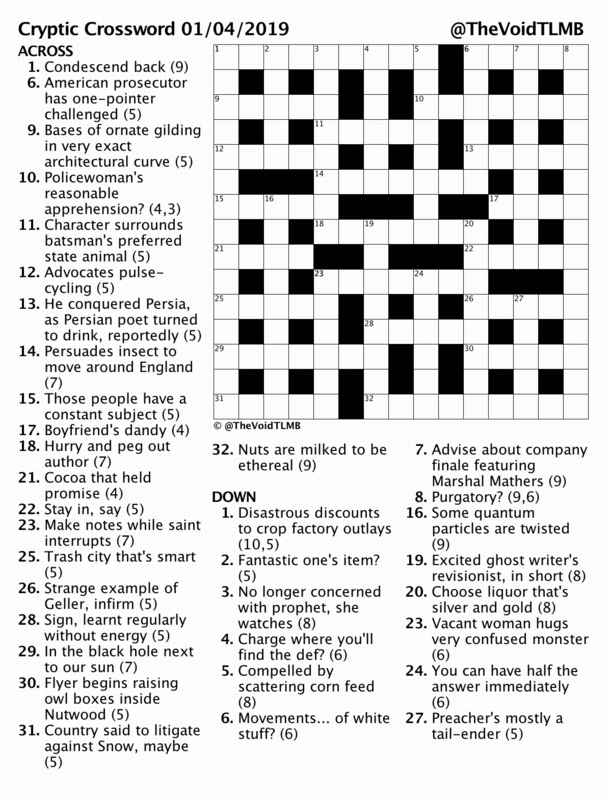 The solution to my January Cryptish Crossword can be viewed in this image. I had this puzzle ready in the dying days of 2018, but couldn’t publish it until Jan 1st, without invalidating one clue. I decided to wait another day to let heads clear. Interestingly, on the day I published, I read an article via Twitter, which mentioned a connection between 17A and 8A which I was previously unaware of. I’m not sure if that’s pleasing or annoying! Let’s be positive and say the former. I liked both 25D and 26D, although I can see why others might dislike them. 29A might be my favourite. No reaction, so I don’t know what people thought of this one. Hey ho. As always, I’m on Twitter for complaints, comments, enthuses or shares. Ciao. Quite a few 4s in this one, so maybe it’s a touch easier? Blockiness reduced to just four 2×2 squares. Hopefully tolerable. One clue might annoy some, but there you go. As always, feel free to let me know via Twitter if you’re trying/done it/liked it/hated it, and RT/share if you like.